Our curriculum has been designed to not only enable students to access the best universities but also to provide them with the skills needed to become leaders in their community. Our aim is to create independent young men and women who have the knowledge, skills and motivation to make a difference to the world around them. Our vision for teaching and assessment is for each classroom to help instil an independent passion for learning and an inner confidence in all students. The curriculum focuses on depth before breadth and follows a mastery approach where the key knowledge and the conceptual understanding required for subject is developed across the key stages. There is a specific focus on literacy and numeracy with extra support provided where necessary to ensure all students progress. We believe that all students have the ability to excel and consciously teach them to challenge and push themselves through embedding a growth mindset into the curriculum. This means that students are encouraged to see attainment not as something that is fixed but as something that develops with hard work and perseverance. At Globe, we specialise in Mathematics and the Performing Arts. The Mathematics Department adopts a 'Mathematics Mastery' approach to teaching and learning. This is an innovative mathematics programme based on international best practice and gives students opportunities to gain a deeper understanding of key topics. In addition to the classroom curriculum, extra-curricular opportunities in Mathematics are also available. Our students participate in the Ark Schools and UK Mathematics Trust individual and team maths challenges. There are also many opportunities provided by the Performing Arts Faculty. Every student gets involved in our music and arts programmes and many take part in our school shows, in the Ark Schools Shakespeare Festival and the Ark Music Gala. Students also take part in residential choir and orchestra weekends. We make use of our links with outside providers and hold the Arts Council ARTSMARK Gold Award for Excellence in Arts Education. To have a student-centred approach to the curriculum and create personalised pathways, if needed. 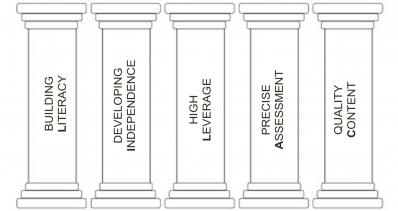 To have consistency across the curriculum with all lessons embedding the key academic principles known as the Five Pillars. Content is rigorous and high quality, as well as knowledge-driven. There is a focus on depth before breadth with extra time provided for literacy and numeracy. Subjects follow a mastery approach where the key knowledge and the conceptual understanding required for subject is developed across the key stages. More time is given to subjects than most other schools as students have 6 periods of 55 minute lessons a day, giving them 27 ½ hours of curriculum time a week (2 ½ hours more than most schools). Key Stage 3 is two years, with students choosing GCSE Options in Year 8. Key Stage 4 students follow an EBACC pathway at GCSE with exceptions made for students with specific needs. Students with specific needs have reduced options at Key Stage 4 to allow for extra literacy and numeracy support. Students are able to access the best universities with 52% of our 2017 Sixth Form cohort going to a Russell Group University (the top universities in the country). We have alumni at the top universities such as Cambridge, Warwick, UCL, Bath and Bristol. Students’ life chances are increased as we ensure that even those that do not follow traditional academic pathway have the best opportunity to access university through our vocational and pathways programmes. If you have any queries about particular subjects, please contact the Assistant Principal responsible for the different faculty areas. For wider curriculum questions, please contact our Vice Principle responsible for curriculum.